Whangaroa Winter Warmth! - check out those heart-warming wood-burning fires !! Romantic Eco-cottage, ideal for a couple or privacy-loving solo, but can sleep children (enquire:- 3 best-quality camp beds available and baby cot). Seaviews from bed! Free Wifi. Outside bath, under native trees and tree ferns, with Waitapu Bay waters right there in view; utterly private! Library of books and travel advice; games, cards; hammocks; bird whistle; wood-burning inside stove; fire-pit, firewood. There is a wide and easy walkway 100m along to the harbour waters of Waitapu Bay; at high tide, step off the land into knee-deep water: at low tide, walk along the foreshore under the aged pohutukawa trees and pretend you are Robinson Crusoe. Wood-fired and gas BBQs provided. So cooking own meals very possible, or patronize local cafes. Access road now sorted; Volvo drivers manage it, even Evil Knievel could too! Sewerage system is completely eco-friendly. Two huge water tanks hold an ample supply of drinking, showering and bathing water. Fish from the property, or from the wharf: fish regularly caught include John dory, snapper and kahawai. Ocean sailing charters, art and crafts outlets, kauri forests, all await you. Walk up St Paul's Rock or stroll the 1.5kms down to the local Marlin Pub or Fishing Club, both with restaurants. Lovely beaches at Tauranga Bay (15 minutes' drive) and Taupo Bay for surfing (40 minutes' drive). Thai, Indian, and Fish and Chip restaurants within a short drive away. Longer walks: to Lane Cove hut 2 hours; the Mahinepua Peninsula Coastal Walk (1.5hours). Other great walks: Taratara Boulders, Puketi Kauris. Smoking is only allowed outside the eco lodge. 2 Nights Minimum: BUT if only one night stay suits you, then please enquire of Terry your host if that is convenient for him; a NZ$ 50.- surcharge will apply. Powered solely by solar panels. La Grange is ideal for a single person or a couple. Pakeha or European New Zealander; Kiwi in other words; baby boomer; traveled the world for my work and also following my own interests; I love nature, books, travelling, languages and people. Married at 35 to an English person, 2 kids later and Cold War heating up, we repaired to NZ home to look for land to buy for security for family, Saw this piece of land of 37acres=15ha and bought it overnight; best thing I ever did, now with no wife but with a very fulfilling property and environment. Set in regenerating native bush, native birds, and stunning sea views. The perfect getaway! This place/space is a once-in-a-lifetime experience, truly unique! Bathroom is private, with lockable door; has shower, WC, handbasin and slip-proof floor. OMG !! a string of beachy pearls along the Million Dollar View Drive; then Taupo bay a surfer's beach; all white sands & seashells & family-safe; BeachTauranga bay 15mins with secret Butterfly Bay. 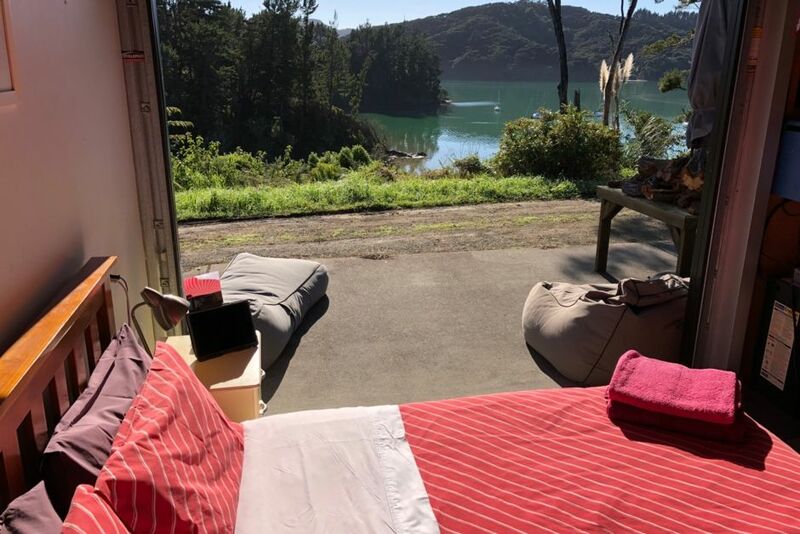 From bed, before getting up, press button on the automatic remote control and the large door arises to reveal an intimate view of Waitapu Bay, with 4 to 5 yachts at anchor below you; how cool is that? A 2-minute stroll down to the water's edge, where there are 2 kayaks awaiting your use; kayak through mangrove forests, across Waitapu bay or out to the fantastic West Arm of Whangaroa Harbour. Open the windows and doors. The wood-burning stove; and extra-thick blankets provided for sitting outside around the brazier or BBQ. All bedding and kitchen cloths provided. Use only if power allows; I prefer you to use the washing machine up in my house, always available. Parking to left and right of the EcoCabin. Two large towels pp and also facecloths; spa towels of larger dimensions provided too. A wood-fired fire is inside, with wood provided. Whole interior space is open-plan; couch, seating, loungers all provided. No dishwasher as too much power required; but all cleaning stuff and tea towels provided. Refrigerator & freezer; very low power consumption therefore perfect for solar-powered home. 4-burner stove, fired by natural gas; grill good for toasting; gas oven. I have made the perfect Pavlova in this oven! No microwave because too energy-demanding. Coffee & tea are provided. Please use the grill to toast breakfast toast. Sugar, salt, pepper; all else please provide yourselves. Kitchen is equipped with a gas-fired stove and oven and grill; refrigerator and freezer; all necessary utensils; all needed cleaning materials; hot water is provided by gas caliphont. Inside dining table with 4 chairs; outside dining table for 6<8 persons. Yes, with Freeview TV & radio. Some few books are provided. Two kayaks are on hand down by the water's edge. Everything outside the Cabin is deck or patio. Two-person bath tub ( at a pinch) outside with bay views; hot & cold running water at the bath. Loved the solitude, use of kayaks and the outdoor bath. Terry was a charismatic host and very accommodating. Nice to be able to bring our dog on holiday too. Secluded spot amongst native bush with a great view. The cabin had everything we needed. We had a wonderful relaxing time and would book again without question. The views are stunning and it is so peaceful here - even had a visit from a Morepork too!! Its also a bit of a suntrap too and enjoyed using the outdoor bath. Very nice host - thank you, Terry. We have learned a lot about the history of the area. We enjoyed kayaking and exploring the surroundings. Read Terry's write up on what to do in the area! We absolutely loved La Grange Eco-Cabin! We didn't want to leave. From the stunning views to the outdoor bath and very secluded. I think it had all you need and the potted herbs were a lovely touch. Thank you Terry you're awesome! We look forward to coming back. Had the perfect break away, just wish we'd had another few days. Hardest thing to do was figure out how to do nothing! Everything we wanted from our stay. Peace, tranquility, beauty. Bath was such a treat. Terry is an awesome host. There's nothing I would want to change and I cant wait to come back. Honeymoon Heaven ! Utterly private and nestled in nature accommodation for a couple; total peacefulness and peace of mind assured; Clothing Optional; outdoor bath and indoor shower; all amenities provided; 800m to nearest neighbour (owner Terry). Maybe 200 folk live in Whangaroa but you are furthest away from them; but please do meet up with them in the local pub and local sport fishing club, both with cafes. Visit the Rainbow Warrior Memorial 40mins; see NZ's oldest wooden house and oldest Stone Store at Kerikeri 30mins; climb St Paul's Rock behind your Cabin for superb views 30mins; etc etc.